One tough trailer! Outstanding blooming performance all season. Grows 6"-8" tall. Dainty flowers on a tough little shade plant. Use as accent in tight spots and corners. Grows 6". Attracts butterflies with it's high nectar content. Louisiana Super Plant. Grows 12"-15" tall. Tiny lavender flowers all season. Tough plant. Tender perennial. Sun/part sun. Colorful fruit adorns this plant year round. Protect this accent plant from cold. Both the upright and trailing forms are much improved for superb performance in our hot summers. A true favorite for it's lovely flowers that will always make you smile. Sun/part sun. Grows 10"-15" tall. Lush foliage, inside or out. Best in pots. Will mostly come back after winter if some protection is given. Gorgeous sky blue all season. Tender perennial attracts butterflies. Loves sun and heat! Grows 2'-3'. Burgundy blades make this an excellent accent grass in pots and beds. Annual grass grows 3'-4'. Often called 'Moses in a Boat'. Use as accent and filler in sun or shade. Grows 6"-10" tall. This extra tough plant withstands all conditions. 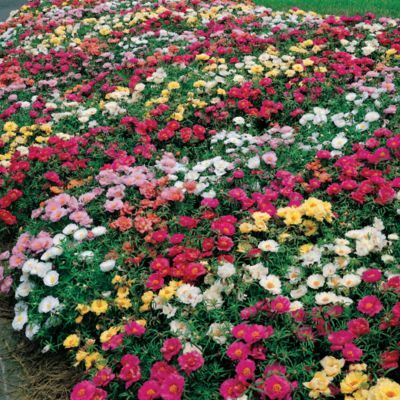 Extra large blooms in all colors on trailing plants. Nice true red color attracts hummers and butterflies alike! Use in mass or singley in pots. Grows 12"-15". Versitile uses year round. Sun in Fall/Winter, shade in Summer. Dead head for best performance. Grows 10"-36" tall. Use in pots to accent other plants. Sun or shade. Will usually go through winter with some protection. Heat loving,fast growing. Cascades over walls, pots, hanging baskets. Sun or shade. Grows indoor or out with very little effort. Use in pots, baskets or as annual groundcover. Spills over pots and baskets in sun to part-sun. Comes in lovely assorted colors. Grows 6"-8" tall. Sun and heat loving, attracts butterflies all season. Comes in an assortment of vibrant colors! Grows 12"-36" tall.